Call them zombies, call them infected, it doesn’t really matter. If you get bit by one, you’ve got about 48 hours before you become one yourself. You’ll have orangeish goo pouring out of your eyes, mouth and nose, an urge to attack and eat humans, and the need to occasionally bury your head in the ground or otherwise get yourself out of the light. Those are the rules of the pandemic depicted in the new Australian horror film (and Netflix original) CARGO. Andy (Martin Freeman) and Kay (Susie Porter) have been riding out the apocalypse on a house boat they found. The plan is to stay afloat until they can reach a military base, but food is running low, and they have to worry not just about themselves, but their one year old daughter Rosie. The good news is, the family finds a stash of food on an abandoned boat. The bad news is, Kay gets bitten by one of the infected that had been hiding on that boat. Andy is determined to get his wife to a hospital before she turns, but as the clock runs out, it doesn’t look like that’s going to work out too well. Kay eventually turns and bites Andy, and now he has just 48 hours to get his daughter to safety and a new family that will take care of her. The odds don’t look good. That’s a compelling premise, and seeing likeable everyman Freeman have to deal with it makes it all the more so. Along the way he meets other survivors, notably an aboriginal girl named Thoomi (Simone Landers), and an opportunistic survivor of dubious morals named Vic (Anthony Hayes). This being a film with several Aborigines in small roles, it’s also mandatory that David Gulpilil (WALKABOUT, RABBIT PROOF FENCE, CHARLIE’S COUNTRY) show up, which he does in the role of a Shaman known as “Clever Man”. 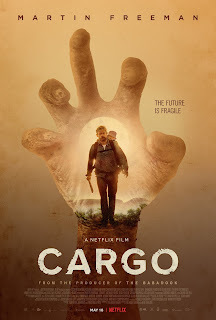 CARGO is a tense, no-nonsense thriller that makes good use of place and culture to give its story a unique flavor. Those who have trouble watching films that place small children in danger will want to take a pass, but if you can get past that, co-directors Ben Howling and Yolanda Ramke (Ramke also wrote the screenplay deliver a first-rate bit of survival horror. Check it out.